Adelh Gifts has been recognized by its decoupage art and was the first in Indonesia since July 2013. All students who have accomplished the complete requirements in the program will be rewarded with Calambour Certificate which is signed by representative of Calambour Asia, the SIFA Decoupage, Thailand. And we will be giving you a special edition of apron from Adelh Gifts with "A Bong" (he is our beloved mascot in our logo) pictures on it, which is not available for purchase as genuine Adelh Gifts merchandise. So proud to see that our students are having a bright future after taking their Calambour Lessons at our studio. 1. Rahel WS. Combined decoupage with her clay creations. Follow her insta: @rahelws Chuelly's Handmade. 2. Ayunda from Pekanbaru now having her very own decoupage studio. She's also teaching decoupage there. Follow her instagram: @les_fleurs_boutiques . 3. Firda Yanto from Makassar now run a party decoration business both in Makassar and Papua, Irian Jaya. 4. Ester Lie opens her own studio, LC House at Yogyakarta. For Central Java area, you can follow and contact her instagram @ek_lie for decoupage class. 5. Christine Yuliana from Samarinda. She seriously took all the lessons and Calambour programmes. Now she's ready to teach all Calambour lessons at her town. Please follow her instagram for enrolling the class: @littlebscorner. 6. Deysiana from Palu. Owner Toko Nam Flower at Palu. For Manado, Palu, or other area at Sulawesi, you can reach her WA for taking course. 7. Ullia Aljabrie from Surabaya. She has a passion to teach decoupage for kids, besides she also owned a decoupage collection with Umigege brand. Kindly follow her instagram: @ullia_aljabrie. 8. Fony from @mujurrotan_makasar has a very beautiful creations and products. Kindly follow and visit her store for your home and cafe decoration! 9. Novie Lestari run her "Little Things for You" decoupage brand. She also open classes for you who are in West Surabaya area. Pleaseee followe her instagram @novie.ruruh for details. Sertifikat yang diterima oleh murid di-issued langsung oleh SIFA DECOUPAGE, Bangkok, sebagai perwakilan Calambour Italia di Asia. 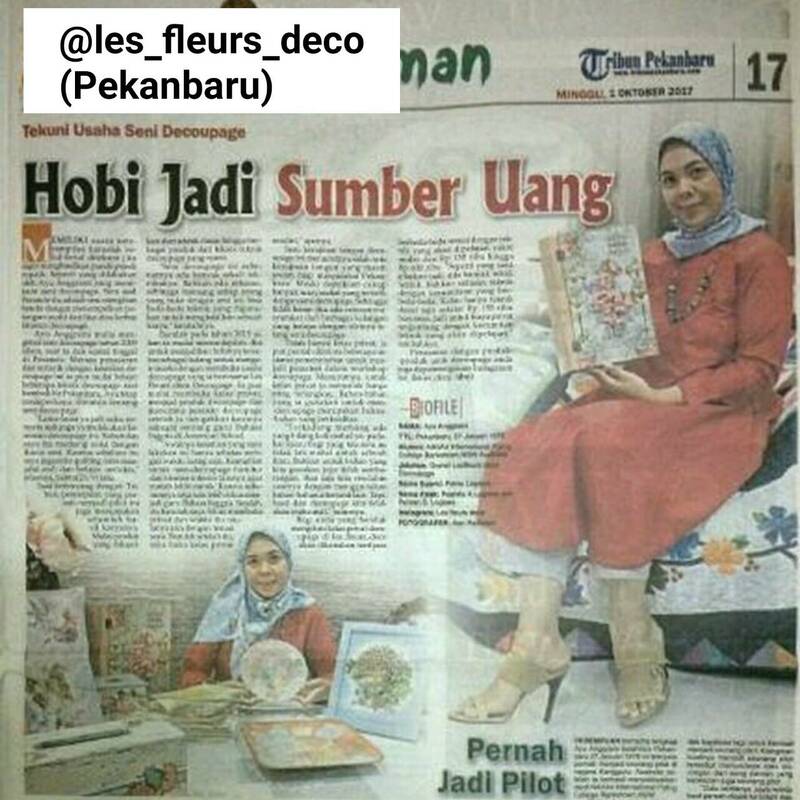 Christine Yuliana, Decoupage teacher dan owner Little B's Corner di Samarinda (salah satu murid kami). Novie Lestari, kini mulai mengajar Decoupage dan menjual Decoupage Art yang indah di Surabaya.